The G Bar G Gold is the same popular style we have had for years, however we have changed the bars. It now sets higher in the front end and also gives you a bigger pocket under the swells. This new bar also allows the stirrup leather room, so they don't get hung up under your bars. or all Rough Out if you prefer. We recommend this saddle for all levels. We recommend this saddle for advanced riders. The G Bar G II Saddle is our style with the deeper feel in swell and cantle and a narrower feel in the ground seat. 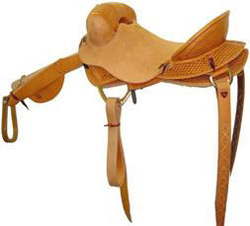 This is the combination of many of the popular saddles made today. This is the newest saddle. It is patterned off of the old-style saddles of the early 70s, as well as a little influence of today's saddles. This saddle has some of the old and some of the new. It sits very well on all types of horses and, when pulled correctly, it stays where you put it. We are hand-making this tree, using a wood, fiberglass, and Kevlar combination to make it as strong as possible. With today's fiber technology, this saddle is very tough and will take a lot of abuse. This saddle is more expensive, but should be the last saddle you need to buy. There are many hours of work in the tree to insure that it is as strong as possible. Half leathers can be a little more flexible in length because you make up the balance and the size of your saddle will change the length also. All leathers are setup for easy Half Leather changes. See Bronc Saddle Setup for more tips and setup information. 1-1/2" x 7 feet and up. Top Grade German Harness Leather with Lace Leather. All double stitched as shown in picture. Extra wide nose band can be made with your initials. Two initials stamped on saddle or halter will be $5.00 extra. All Poly or All Twine or Half Poly and Half Twine. Small, Medium or Large braid. All equipment must have a 25% deposit with the order. 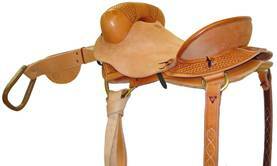 Bronc saddles require a $600.00 deposit. All orders must be paid in advance or shipped balance C.O.D. Payments can be made on equipment, but delivery is not made until paid in full or balance paid with C.O.D. shipment.